Nokia 5.1 with 5.5-inch 18:9 screen, Helio P18 SoC, and Android One now official! Home / mobile / news / nokia / Nokia 5.1 with 5.5-inch 18:9 screen, Helio P18 SoC, and Android One now official! Aside from the Nokia 2.1 and 3.1, HMD Global also made the Nokia 5.1 official. Coming from the first Nokia 5, it has a slight upgrade in specs. 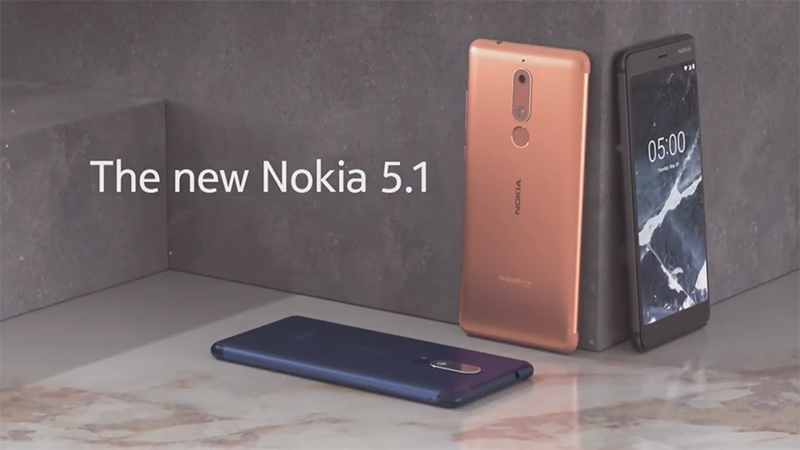 The new Nokia 5.1 now has a 6000 series aluminum body, 5.5-inch FHD+ 2160 x 1080 18:9 2.5D screen, and MediaTek's new 2.0GHz 64-bit Helio P18 octa-core processor paired with Mali-T860 GPU. Related: Nokia 3.1 with 5.2-inch HD+ 18:9 screen and Android One OS launched! It is paired with either 2GB or 3GB of LPDDR3 RAM, 16GB or 32GB expandable storage up to 128GB, and 2,970mAh battery. It'll also come with proximity, light, accelerometer, and gyroscope sensors. The phone boots with pure Android 8.0 Oreo OS with the promise of upgrade to Android P, thanks to the Android One program. The phone measures at 151.1 x 70.73 x 8.27 mm and will come in copper, tempered blue, and black colors. It will be available in July. Price starts at EUR 189 or around PHP 11.5K.